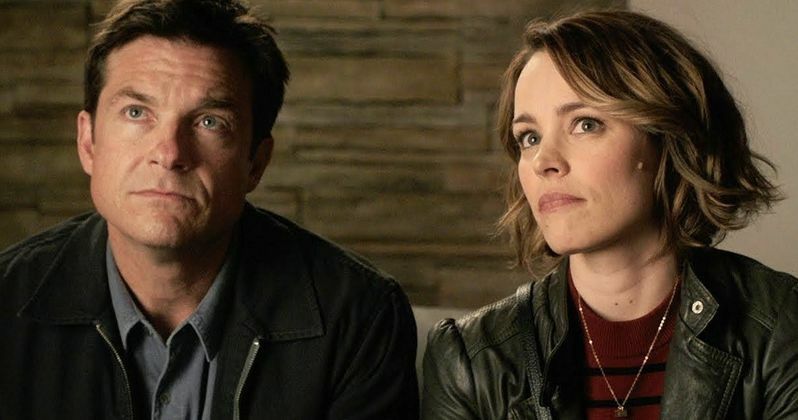 New Line Cinema has released the first trailer for Game Night, the studio's upcoming action comedhy starring Jason Bateman and Rachel McAdams. John Francis Daley & Jonathan Goldstein are directing, marking their second film as co-directors following Vacation. The filmmakers have assembled an all-star cast around Jason Bateman and Rachel McAdams for this comedy about a group of friends whose innocent game night is taken to a whole new level. Bateman and McAdams star as Max and Annie, whose weekly couples game night gets kicked up a notch when Max's charismatic brother, Brooks (Kyle Chandler), arranges a murder mystery party, complete with fake thugs and faux federal agents. So when Brooks gets kidnapped, it's all part of the game...right? But as the six uber-competitive gamers set out to solve the case and win, they begin to discover that neither this "game," nor Brooks, are what they seem to be. Over the course of one chaotic night, the friends find themselves increasingly in over their heads as each twist leads to another unexpected turn. With no rules, no points, and no idea who all the players are, this could turn out to be the most fun they've ever had... or game over. Joining Bateman and McAdams in the ensemble cast are Billy Magnussen (Bridge of Spies, TV's American Crime Story), Sharon Horgan (Amazon's Catastrophe), Lamorne Morris (TV's New Girl), Kylie Bunbury (TV's Pitch, Under the Dome), Jesse Plemons (Black Mass, TV's Fargo), Danny Huston (Wonder Woman," X-Men Origins: Wolverine), Jeffrey Wright (TV's Westworld, The Hunger Games) with Michael C. Hall (TV's Dexter and Six Feet Under) and Kyle Chandler (Manchester by the Sea, TV's Bloodline). While we get to see most of these stars assembled in the trailer, Michael C. Hall's character is nowhere to be found. Perhaps we'll get to see what role he plays when the second trailer surfaces. Daley and Goldstein are directing Game Night from an original screenplay by Mark Perez (Accepted). John Davis (Joy), John Fox (TV's The Blacklist), Jason Bateman and Jim Garavente (Bad Words) are producing, with Marc S. Fischer serving as executive producer. The behind-the-scenes team includes director of photography Barry Peterson (Central Intelligence, We're the Millers), Oscar-nominated production designer Michael Corenblith (How the Grinch Stole Christmas, Apollo 13), editors Jamie Gross (Vacation), Gregory Plotkin (Get Out) and David Egan (Mystery Science Theater 3000: The Return), and costume designer Debra McGuire (Vacation, Ted). The action-comedy will be released worldwide beginning March 2, 2018, where it will have quite a bit of competition. There will be three more movies opening in wide release that particular weekend, Sony's action-thriller Alpha starring Kodi Smit-McPhee, Annapurna Pictures' Death Wish remake starring Bruce Willis and Vincent D'Onofrio and Red Sparrow starring Jennifer Lawrence and Joel Edgerton. Game Night is a New Line Cinema presentation and will be distributed by Warner Bros. Pictures, a Warner Bros. Entertainment company. Take a look at the new trailer for Game Night, courtesy of the Warner Bros. YouTube channel.